Competition provides benefits for consumers. First, more competition means consumers have more choices of goods and services. Second, when more firms are offering goods and services, competition often leads to lower prices. Introduce the lesson by challenging students to think about competition: Can you imagine what our country would be like if monopolies ruled the business world? Under monopolies, there would be no competition. What difference would that make? Competition among sellers lowers costs and prices and encourages producers to produce more of what consumers are willing to buy. Discover the role of the Federal Trade Commission. Explain how competition encourages producers to produce more of what consumers are willing and able to buy. Federal Trade Commission's "You Are Here": This interactive website helps students to grasp the main concepts of competition and the FTC. Lets Compare! : This T-Chart allows the students to compare the two malls' customer service, prices, the quantity of products on sale, and the quality of products. Federal Trade Commission: These are FTC interactive sites that are set in a mall. About the FTC: This article is an extension of the "You are Here" website that has been used throughout this lesson, and it explains the purpose of the FTC. EconEdLink Lessons: These two links will lead you to age-appropriate lessons on competition. 1. Make copies of the PDF fact sheets below for the assessment. You will break your class into five groups. Each person in the group will have a different copy, so you will only need five or six copies of each PDF fact sheet. 2. 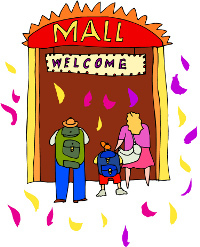 Tell the students that they are going to compare two different shopping malls. One mall has four clothing stores, two shoe stores, and one fast food place in the food court. The other mall has one of each of these stores. Put a T-chart on the board (the student version of this lesson has a T-chart entitled "Lets Compare!") and compare these two malls customer service, prices, the quantity of products on sale, and the quality of products. 3. The students should conclude that when a consumer has many choices, sellers work hard to attract business. They must keep their prices low, provide high quality customer service, offer an array of goods for consumers to buy, and make sure that the goods they offer are of high quality. If the sellers don't have the merchandise consumers want, or the merchandise is poorly made, or the prices are too high, or the sales people are rude when they serve consumers, then the consumers can buy the merchandise they want at a different store. 4. Tell the students that they will now go to a government website that is designed to help consumers find out about competition. They will be in a food court deciding on what to buy. Tell students to go to the website and click on "Go to The food Court ". Click on "Pizza, Pizza, or Pizza? " to find out how competing pizza places try to get your business. 5. Ask the students if Emily and Isaac chose the same pizza they would have chosen. Discuss responses briefly. Then explain that shows that competition allows consumers to get goods and services at a lower price, with more choices, better quality, and better customer service. 6. Define mergers as the combination of two or more commercial companies. Tell the students that sometimes stores of the same kind get together and merge. 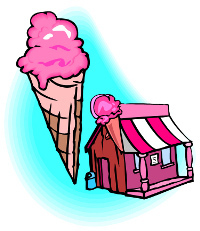 Then have them click on "Tripple Cold Creamery" to find out what happens when competition is taken away. 7. Discuss the students' responses to the information from the Creamery website. Offer clarification as necessary: The ice cream server showed us how the merger between the two ice cream stores led to lower prices. So competition works in our "flavor" -this time, cookie dough! She also warned us about mergers. She said that when mergers take away all the competition, then they are called monopolies, and monopolies have to be approved by the Federal Trade Commission. A monopoly is a market where there are many buyers but only one seller. The FTC does allow for some monopolies. An example of a legal monopoly would be utility companies. Those companies actually keep prices lower for customers, so the FTC gives them the right to be a monopoly. 8. Explain that the Federal Trade Commission is an independent agency of the United States government. It is a consumer protection agency, and its job is to maintain fair and free competition. So, how does the Federal Trade Commission protect the consumers? The federal government enforces antitrust laws and regulations to try to maintain fair levels of competition. 10. Compare the students' answers with Issac and Emily's answers. In the course of your discussion, explain that monopolies, price fixing, and bid rigging all are illegal in certain circumstances. Present these questions to your students and have them respond with a short answer on the tablet below. See this fact sheet To find out even more About the FTC (The Federal Trade Commission). To find more lessons on competition, check out other EconEdLink lessons for grades 3-5 and/or grades 6-8. Break the class into five groups. Pass out one of these PDF fact sheets to one person in each group (for a total of five different sheets per group). Each group member will read his or her article and then make a presentation to the group on the article's content. Then, have the students write a pretend e-mail to MallOwnersofAmerica.com and explain why the mall where they shop needs more than one pet store, one book store, one sports store, or one technology store. Instruct them to make at least three key points using their knowledge of competition, in their letters.